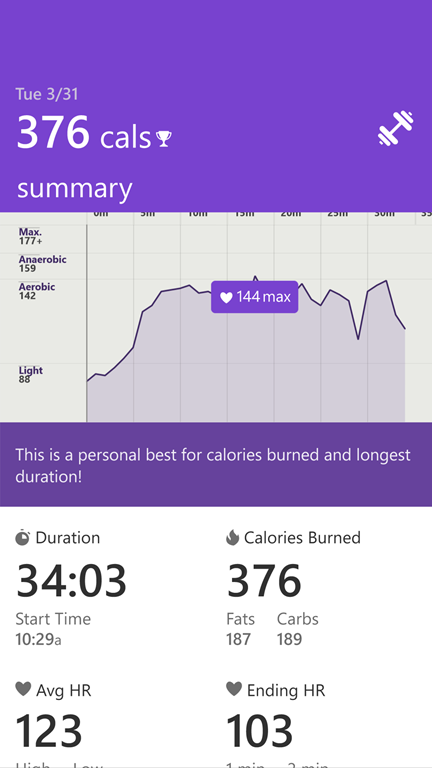 Since it was introduced I’ve been fascinated with the Microsoft Band. I’ve known people with fitness trackers that gave information on things like steps, or even monitored sleep, but they never really interested me. I think it was because the devices themselves were so simple and did only a few things. Plus there was no interaction with the devices. I really liked that the Band provided lots of monitoring options (heart rate, sleep, steps, calories, workouts, runs, cycling, UV) plus had the built in UV and other sensors. It just seemed like a significant step up from other fitness devices. I also liked that it paired with an app on the phone, but didn’t require the app for many functions. I finally bit the bullet and bought one, and these are my first impressions. I’ll write more after some significant use. I’d looked at the Band at the Microsoft store in my home town several times and tried it on. However, they never seemed to have it in stock. I finally decided that it was just easier to order it from the Microsoft Store. I ordered it last week and got the free shipping so it arrived yesterday. I think Microsoft has really stepped up their game on the packaging of their hardware products. Whether it is the fully recyclable packaging on the XBox or the simple packaging of the Band in a simple box with the device, charging cord, and a few quick pamphlets (quick start and warranty). I took the Band out and plugged it in to charge. Immediately upon starting it went into pairing mode looking for my phone. After I installed the Microsoft Health app on the phone, the pairing was simple. The Band needed an update which I thought would be a giant pain, but the phone downloaded the update and flashed it on the device. The whole thing took about 2 minutes total and I was up and running. One of my biggest concerns was how the Band would feel when wearing it. I’ve heard many people complain about it being bulky and inflexible. When I’d tried the Band on at the store it definitely felt awkward and didn’t seem to fit well despite my confidence that I had the right size. The semi-rigid strap had me concerned. Honestly though, when I got the device and put it on, it immediately felt more comfortable than the one in the store. I’m not sure why that is, and it may be all psychological since I’d committed to buying it, but it definitely felt better. After wearing it for a day, I can say that it isn’t any more uncomfortable than a regular watch. I haven’t worn a watch for several years, so for me to not really be bothered by it is something. I still haven’t decided if I like the display on top or bottom of my wrist. Given the orientation of the display, it is much easier to read it when the Band is worn “under” the wrist. But it feels more natural, and less like to scratch the display, to wear the display on top of my wrist. I think I’ll have to keep trying it both ways to figure out what I like. It’s also possible I’ll like different positions for different activities. I want to really do my best to take this thing through the paces and try everything. Last night I used the sleep tracker and it was cool to see how it tracked the time to get to sleep, when I woke for a few minutes at midnight, and the various depths of my sleeping. 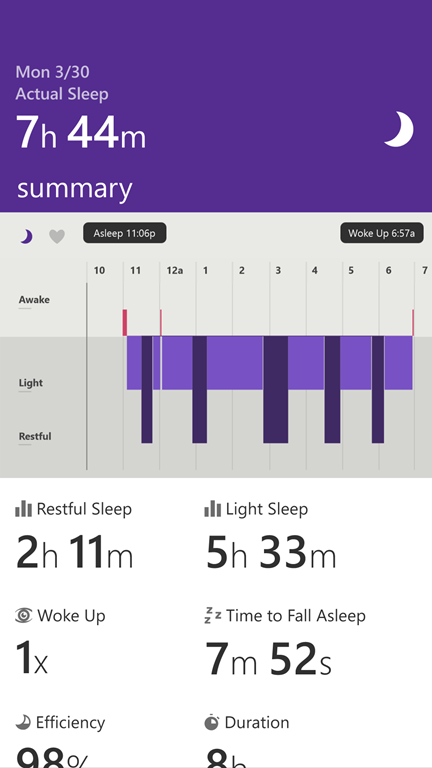 The heart rate and overall sleep metrics were nice to see. I’m looking forward to seeing some of this data over time and then using it in conjunction with data about calories burned and other information. I think I might need to keep track of general feelings of how refreshed I feel on given days, how strong I feel during workouts, and how productive I am to use alongside the data the Band provides. Today I did a weight workout and so just as I started up I hit the workout tile then the action button to start tracking the workout. The tracking was simple, but helpful. It showed me the time elapsed of my workout plus my current heart rate and calorie burn. I was mostly interested in the heart rate since my workout duration was set and I wasn’t trying to hit a calorie goal, but it’s nice to have those other things for different types of workouts. I tried the UV sensor a few times and got varying results. Once, with the sun on my arm/Band I got no reading. Another time I got a nice reading telling me that it would take about an hour for me to burn. I’ll need to try it out again and see if I can get more consistent output. I also really like the haptic feedback when receiving text messages, Facebook messages, or emails. I don’t always feel my phone vibrate when it is in my pocket, but even on the lowest setting I feel the Band vibrate. I didn’t tend to read the email or text messages on my phone, but the general notification and ability to do a quick glance to see if it was something I needed to pull my phone out for was a nice feature. I also put my Starbucks card into the Starbucks tile, but didn’t have the chance to try it out. It’s just a simple bar code, so I’m sure it will work fine, but the logistics of getting the watch in front of the scanner may not work as well as it does for a phone. Tomorrow I’m going for a run and going to try the run tracking capability without my phone. I typically run with a Garmin GPS watch and I’m going to take that along as my baseline to see how well the GPS in the Band does in comparison. I like that I’ll be able to track my heart rate without a chest strap (something that’s kept me from using the heart rate monitor with my Garmin for running or other workouts). I haven’t tried the Cortana integration yet either but I’d like to try it for some basic searches and setting up reminders or calendar entries. All in all, I’ve enjoyed my first day with the Band and I’m happy with my purchase. I’m looking forward to really trying out all aspects of the device. And of course, as a developer, I’ve downloaded the SDK preview and I’m thinking of things I can develop that will integrate with the Band.